Our prototype bond fixtures are designed with math cut tooling nests, shimable datum locators, and vacuum cups. 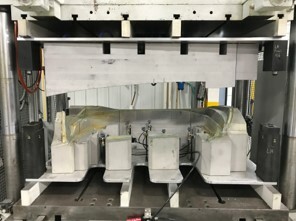 Each fixture cavity is machined with heat troughs in which allow heat to be applied evenly to the bond surfaces. The tooling is designed for quick changeover within our press. This allows us to manufacture prototype parts on production like tooling. For larger assemblies, bond fixtures can be designed to be placed within our walk-in oven. This creates another opportunity for bonding. 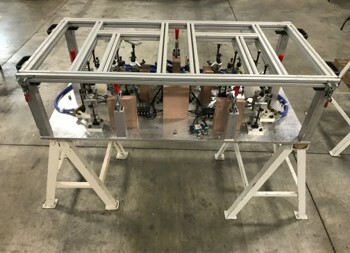 Our mechanical assembly fixtures are designed with math cut tooling nests, shimable datum locators, manual clamping, steel or aluminum framing, and casters as needed. This allows us to repeatably assemble multiple components while having the ability to move the tooling throughout the facility with ease. Our CNC tooling is designed with math cut tooling nests, shimable datum locators, vacuum cups, and manual clamping as needed. All CNC tooling is designed for quick changeover within our CNC machines. Our equipment and manufactured fixtures allow us to produce production level parts at the prototype level.